With the largest brick selection in the area, we will be able to give you ample choices in color, texture and size so that your brick needs can be met. We provide bricks for residential, commercial and governmental projects. We display face bricks (wall bricks), thin bricks and brick pavers in our showroom and they are arranged in color order. Also available are brick shapes, custom arches and fire brick. For you to begin your brick selection, you could do one of three things. 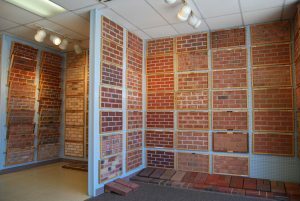 First, you could visit our showroom and look at our many brick samples. For those that you might like, we can give you a street address of a house made of that brick. Looking at a house of the bricks permits you to see a large scale display of the brick. Alternatively, if you know the address of a house that is made of a brick that you like, give us that address and our sales personnel will identify it for you. Thirdly, if you have a sample brick that you are trying to match, bring it in and we will identify it for you. If you are looking for a brick mason, give us a call and we can give you several names and phone numbers of excellent brick masons since there are many excellent brick masons in the area. For the convenience of our customers, we sell face brick in strap quantities or multiples thereof. Bricks are approximately 100 per strap. Paver bricks can be purchased individually. No brick returns – face bricks or paver bricks – are permitted other than full cube quantities (generally about 500 bricks per cube).